Poison ivy vines grow up to 10 feet high, wrapping around trees and fences. Poison ivy leaves contain an oil that causes an allergic reaction in humans. An itchy rash and blister forms on the skin when someone comes in contact with the poison ivy. 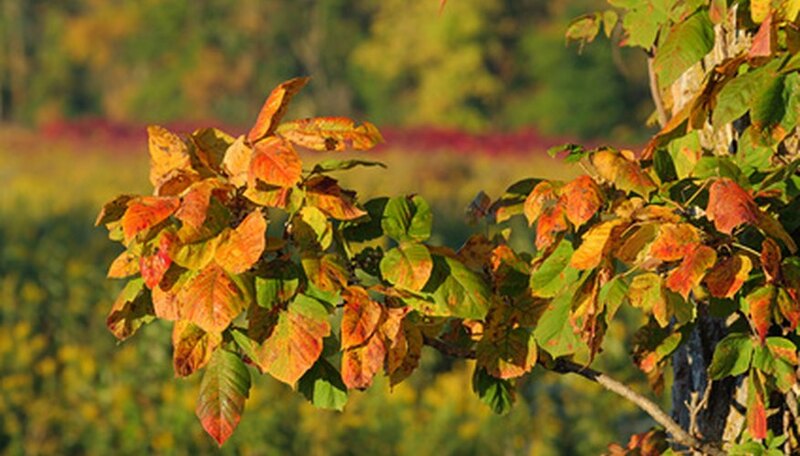 Before killing poison ivy vines, take precautions to protect yourself and nearby plants. Select a day to kill the poison ivy when no rain expected. Rain will water down the herbicide and render it less effective. Dress in long-sleeved, protective clothing, gloves, boots and goggles. Protect your skin from coming in contact with any parts of the ivy plant. Cut the ivy leaves down with pruning shears so that they are only 6 inches high. Spray an herbicide with the ingredient glyphosate on the ivy leaves. Don't spray so much that the chemical drips off of the leaves. This herbicide will kill any other plants or vegetation that it comes in contact with, including grass surrounding the ivy plant. Wash your clothing with hot water and detergent. Also wash the pruning shears to remove any oil from the poison ivy. Repeat these steps every two weeks for one month, or until the poison ivy plant has died. You can dig up a poison ivy plant, but if you do not get every little piece of root it will grow back again. Never burn poison ivy. Breathing in the burning oils from the plant can make you sick.